My Christmas decor in our sun room is done in silver, white, and red this year. With those three colors in mind, I went shopping for items to use to make a new indoor wreath for our sun room. I love the combination of sparkly silver with red. 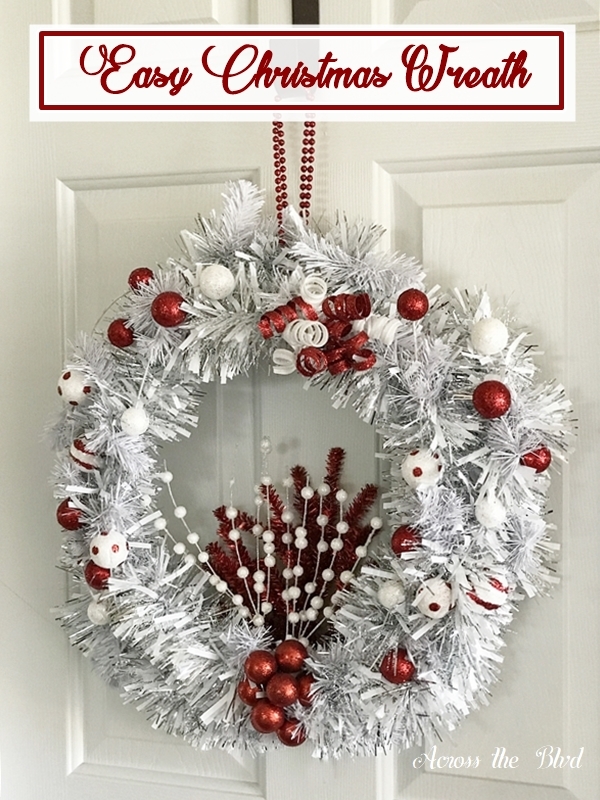 Today, for the 12 Days of Christmas, we’re sharing how to put together an Easy Christmas Wreath in Silver and Red. I found the work wreath at the new Old Time Pottery that just opened over the summer near me. This was my first time shopping there and it was amazing! The prices were great. I’ll definitely be a frequent shopper there. 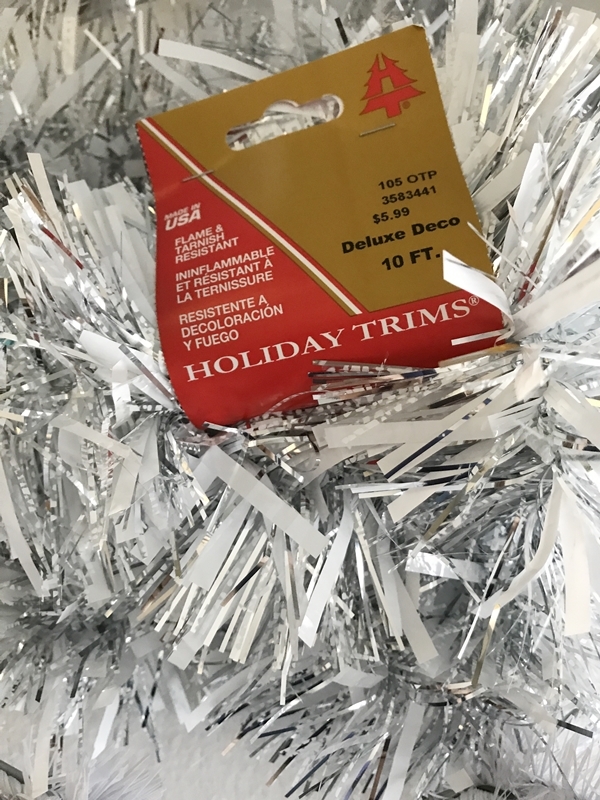 I purchased a number of items that I thought I might use for either this wreath or for other holiday crafts. 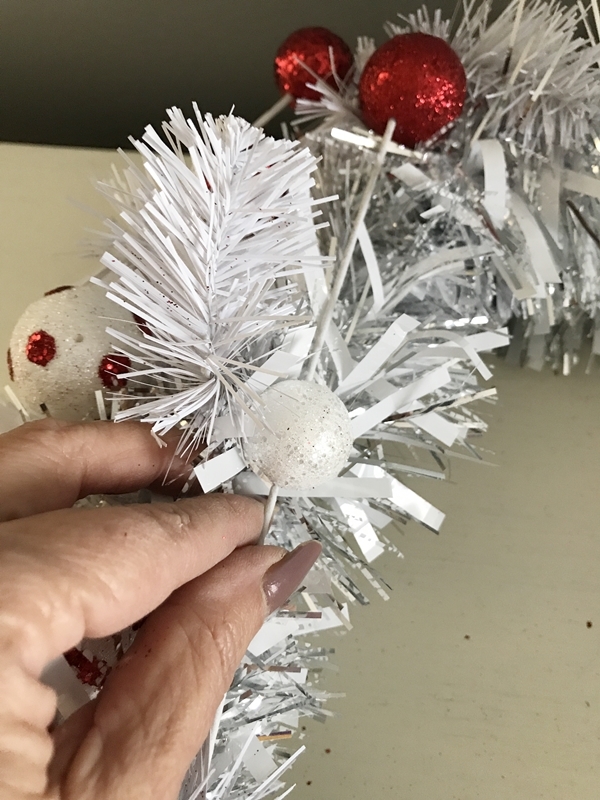 I began by spreading out the branches of the work wreath, opening them up so that I could attach the garland. I draped the garland around the wreath form, securing it with the branches along the way. The fun part of wreath making is always adding the embellishments. I spent a while trying to decide on what pieces I wanted to use for the wreath and positioning them in various ways until I was happy with the look. 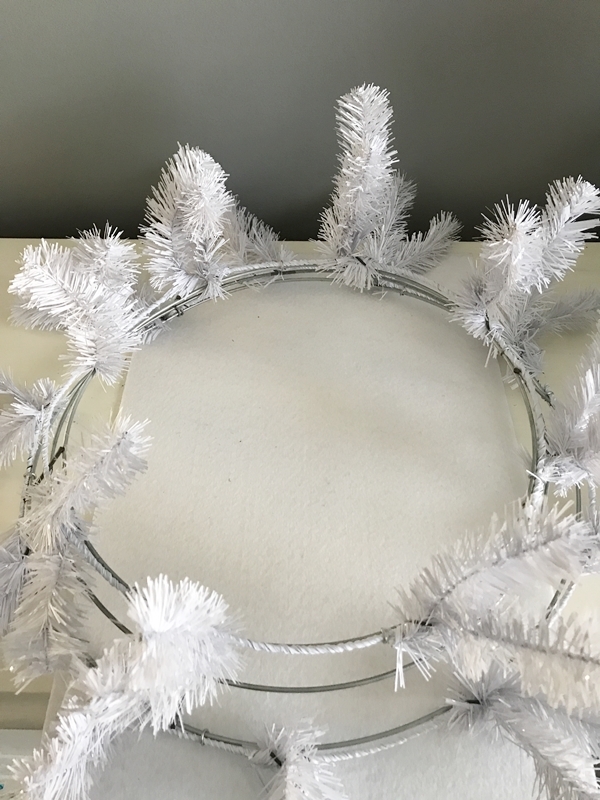 The stems and picks are all secured using the branches of the work wreath or by using white chenille stems. I used mini red ornaments purchased at the Dollar Tree to make a berry bunch for the wreath. 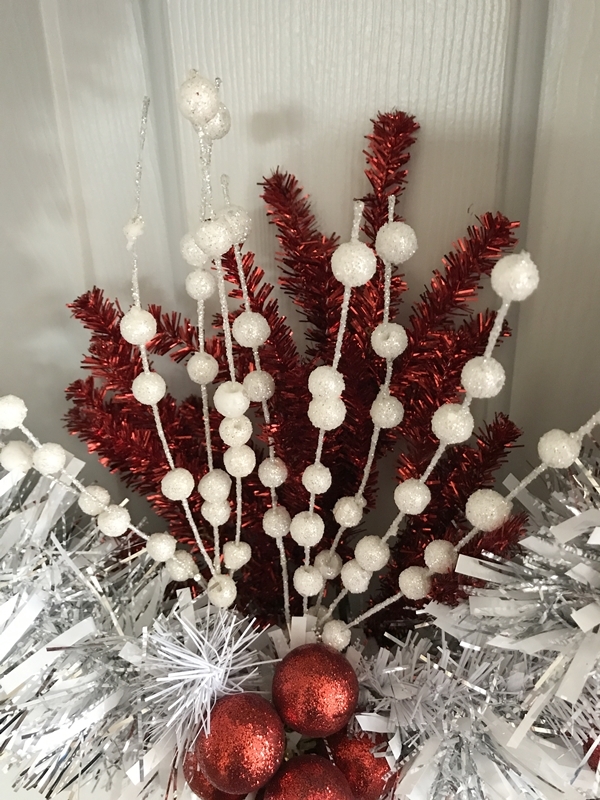 I ran a chenille stem through the hanger of each ornament and bunched them together. The chenille stem is attached to the wreath by looping it over and under. I thought I was finished with the wreath, but as I stood back and looked at it, the center looked to be missing something. 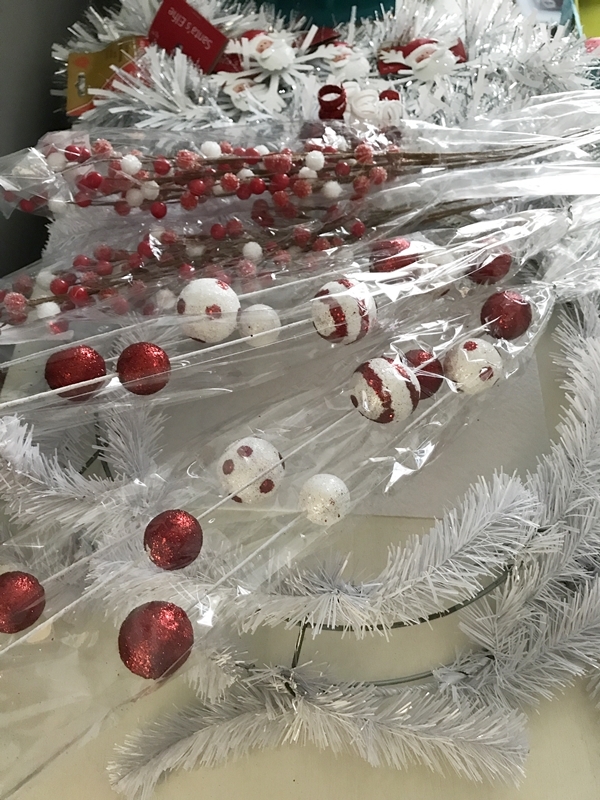 Rummaging through my Christmas craft stash, I found a package of red stems that I purchased at Target during the after Christmas sale last year. They were perfect for this wreath. 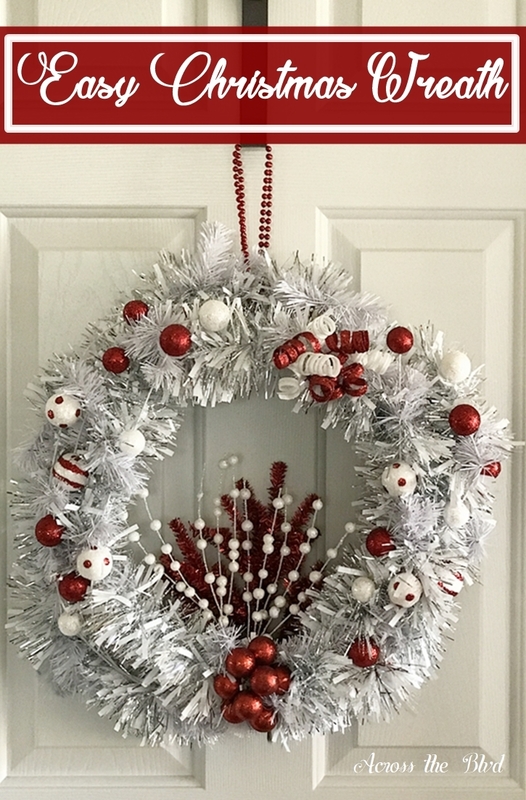 I used a strand of Dollar Tree beads to hang the wreath. 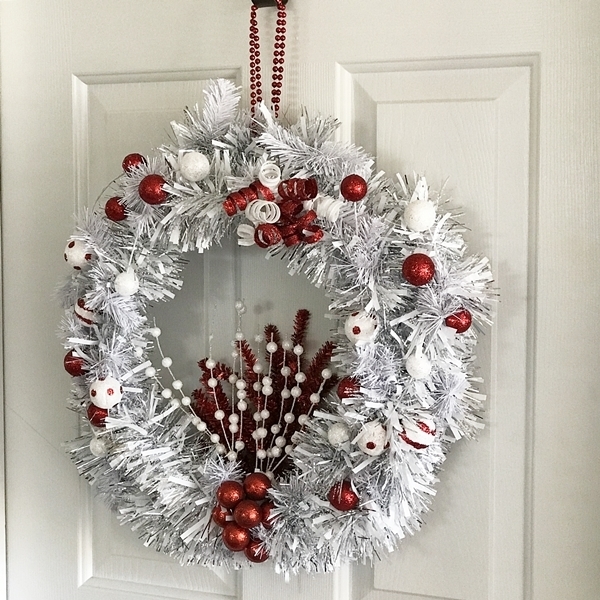 I love the festive look of this wreath and it’s going to go well with lots of my other silver and red decor. Using a work wreath makes it easier to put a wreath together, but this could be done with any wreath form. 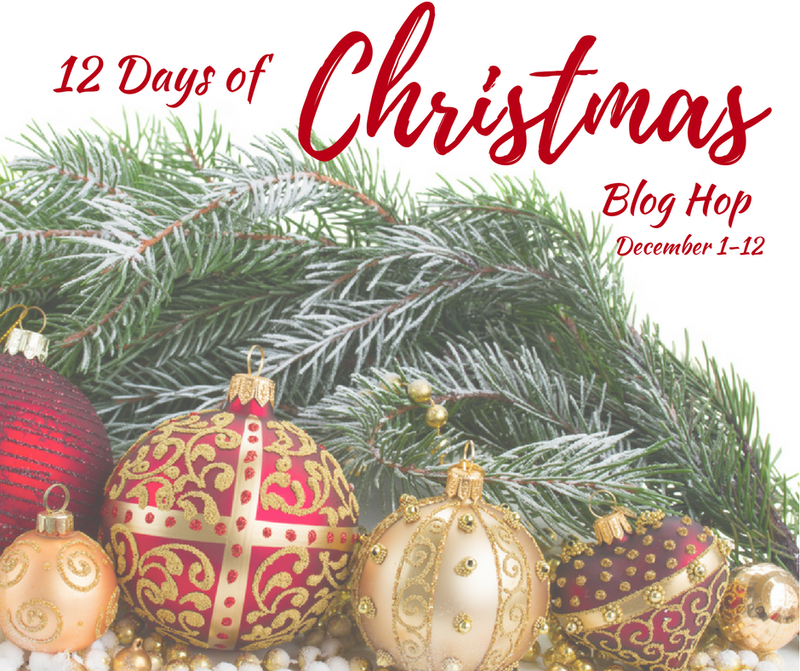 Adding an assortment of picks, stems,and ornaments is a simple way to dress up any wreath. And for the first time ever I think, I didn’t even plug in my hot glue gun! This looks so pretty. My favorite is the polka dot balls. Thank you, Jenny. I love those polka dots stems, too. I think the bling in this wreath is gorgeous. Its fluffy and fun and it makes me want to celebrate. Very nice wreath. I love the bling and the sparkles for this, too. 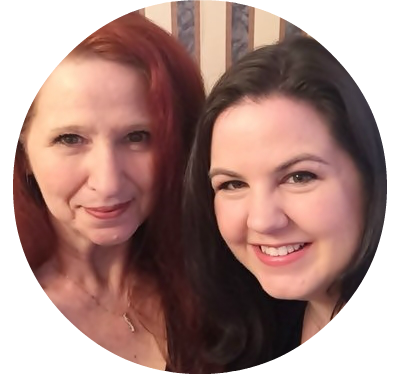 Thank you, Leanna! This is gorgeous and you finished the center perfectly! Beautiful. Love the use of the white base, with the fun pops of red! I am slacking this year – I still have my fall wreath up on the door. Oops! Hehe. Pinning this one to my Christmas board. It was a fun and easy wreath to put together. Thank you, Alexandra! Thanks for pinning! I love the way your wreath looks and it’s just perfect for Christmas. Thanks for sharing at C&C with J&J. Thank you, Julie! 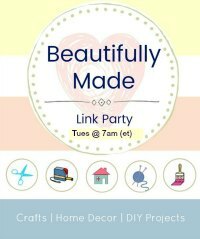 Thanks for the party each week! This is so lovely. I love how the color combo’s you used. 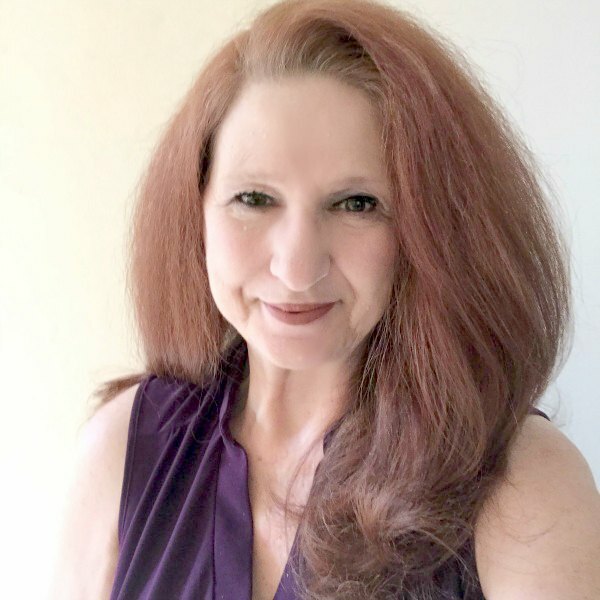 Thank you, Debra! I love the color combination,too. This is absolutely lovely Beverly. All that shine from the silver really makes it stand out!! Thank you, Mary! 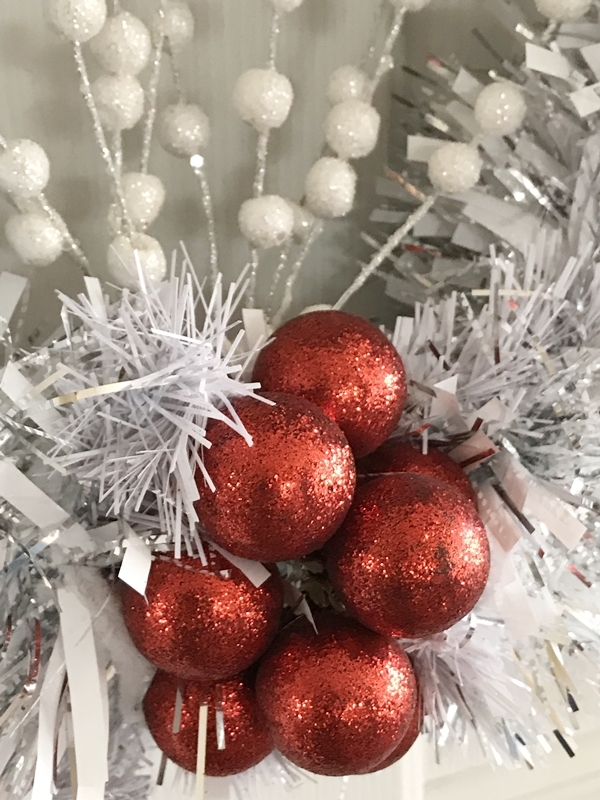 I’m loving silver and red this year for lots of my decor. Such a lovely Wreath! I love that it’s red and white. And I love the floral picks and ornaments you added. pinning! Thank you! I’m loving those colors for lots of my decor this year. Thanks for pinning! 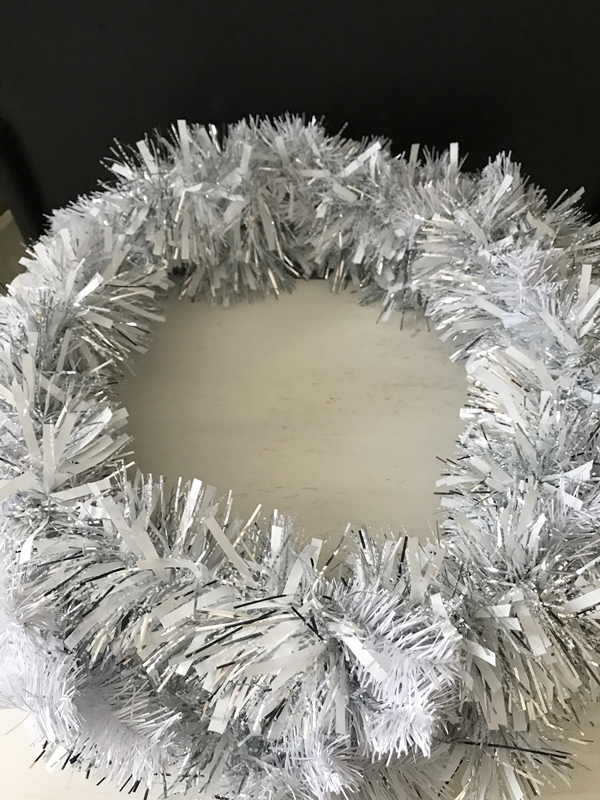 That silver and white garland is great, the whole wreath is beautiful! Thanks! It was a fun wreath to put together.